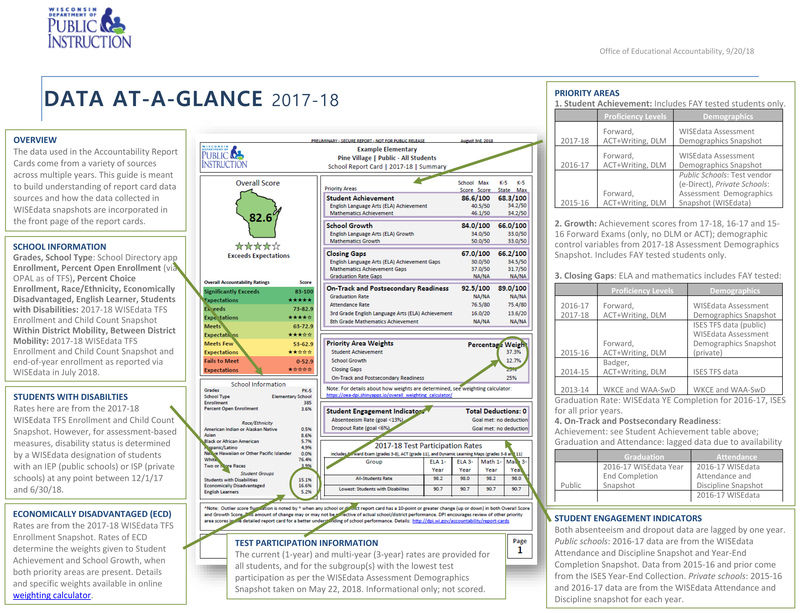 The Wisconsin Department of Public Instruction released a new federal report today called the Joint Federal Notification Packet for all schools in the state. It is used to notify schools that are Identified or Not Identified for improvements. Mauston schools received the "Not Identified" status. The Joint Federal Notification Packet will become an annual report. It fulfills two federal laws. the Every Student Succeeds Act (ESSA), and the Individuals with Disabilities Education Act (IDEA). The packet uses much of the same information that is used to calculate the Wisconsin Schools State Report Card. Principals will incorporate the information contained in this report into each school's continuous improvement work. If you are interested in reviewing the new federal notifications, you can access our school's report here on the DPI website. Please contact me if you have any questions about our results. Thank you for helping us to support students in there learning! Dr. Christine M. Weymouth, Ph.D.
District and School Report Card information is out this week. The 2017-18 Report Cards represent student data based on the 2017-18 school year, which was last year. This year’s report cards reflect that our students continue to grow in English Language arts, and Mathematics and that our schools have satisfactory standings. A remaining challenge, for one more school year, is that our high school standing reflects Meets Few Expectations. It is important to know that all 9-12 high school report cards across the state reflect an ACT achievement score only and do not include the academic growth factors that are entered into an Overall Score of K-8 and 6-12 schools. For one more year, the high school report card will not show the actual growth factor in its calculations. In this way, because MHS is not a 6-12 high school, it is more difficult to achieve a high Overall Score. Academic growth from grades 6-8 are not calculated in the score. Whenever our schools are able to use a growth calculation, their standing is going to be higher, because it shows growth over time. There are some changes in how the report cards look this fall. The 2017-18 Report Cards include data from multiple years of state assessments that include the Forward Exam grades 3-8 in English/Language Arts (ELA) and Mathematics, the ACT+ Writing in grade 11 and the Dynamic Learning Maps alternate assessment for students with significant disabilities. The calculations that go into creating the overall score are complex and include achievement and growth from the spring assessments, closing gaps and postsecondary readiness scores. This year’s report cards also show how each of the priority areas are weighted in the score. 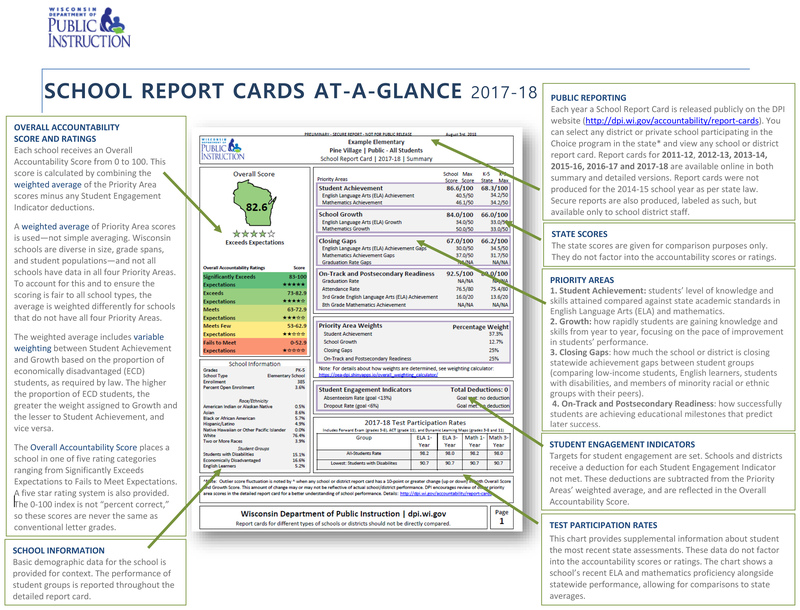 The 2017-18 report cards can be found at https://dpi.wi.gov/accountability/report-cards. We are excited to see that Mauston High School, Olson Middle School and Grayside Elementary School, earned an increase in the Overall Score on the Report Card over last year's scores. Lyndon Station saw a slight decrease in the score and the School District of Mauston score remained steady. Overall, Mauston students showed more growth compared to students in the state in both English Language Arts and Mathematics. This means that our students are growing more than they are predicted to grow based on past performance. Mauston High School’s Report Card saw a small increase in the Overall Score. The biggest increase was in the Closing the Gaps score which increased by 6 points. There was a less than one point decline in the Achievement score, however that is a smaller decline than the state which saw a drop of 2.9 points in the achievement score. Note that Mauston High School does not receive a growth score on their report card because they are a 9-12 school. In general it is fair to say that 6-12 high schools, because they can account for a growth score, generally score higher than a 9-12 high school. This will change next year when the state begins including scores from 9th and 10th grade testing in the score calculations for the report card. Olson Middle School’s Report Card saw another strong score with an increase over last year’s Overall Score. Growth continues to be the strongest area with Olson students scoring 20.9 points higher than the state. Another strong area is Closing the Gaps, where Olson students again outperformed their peers in the state. Achievement remained below the state, but each year the gap between the Olson achievement score and the state gets smaller. One can interpret this to mean that our Olson Middle School students show growth and achieve positively each year. Grayside Elementary School’s Report Card also saw an increase in its Overall Score. The strongest gain was in the Closing the Gaps area of the report card. Grayside students that are economically disadvantaged and students with disabilities made gains to close the achievement gap between their scores and their non economically disadvantaged or non disabled peers. Achievement and Growth scores remain slightly below the state. Overall, the improvement efforts that teachers are implementing are making a difference in learning for students. Lyndon Station Elementary School’s Report Card has another strong Overall Score of 82.5 which puts it in the Exceeds Expectations category. The score is slightly lower this year, however most of the score is dependent on student achievement alone. Students continue to perform at higher levels than the state in both English Language Arts and Mathematics. Lyndon Station does not receive a Growth or Closing the Gaps score due to the small population at the school. Three of our schools fall under the Alternative Accountability process. The iLEAD Charter School receives an Alternative Rating because too few students are in the tested grades. iLEAD Charter School received a rating of Needs Improvement. The Mauston Montessori and West Side Elementary schools receive an Alternative Rating because students in these schools are too young for the state assessments. West Side Elementary School and Mauston Montessori School received ratings of Satisfactory Progress. Satisfactory Progress and Need Improvement are the only two scores possible for schools who fall into the Alternate Rating process. The 2017-18 Report Cards include data from multiple years of state assessments that include the Forward Exam (2015-16, 2016-17, & 2017-18) grades 3-8 in English Language Arts and Mathematics, the ACT + Writing in grade 11 (2015-16, 2016-17, & 2017-18) and the Dynamic Learning Maps (2015-16, 2016-17, & 2017-18) alternate assessment for students with significant disabilities. Detailed information about how school and district report cards are created can be found on DPI’s Report Card webpage. Below are a few tools we hope you find helpful.